MOSCOW -- President Bashar Assad’s government came under mounting international pressure Thursday for Tuesday’s chemical attack in northern Syria, with even key ally Russia saying its support is not unconditional. 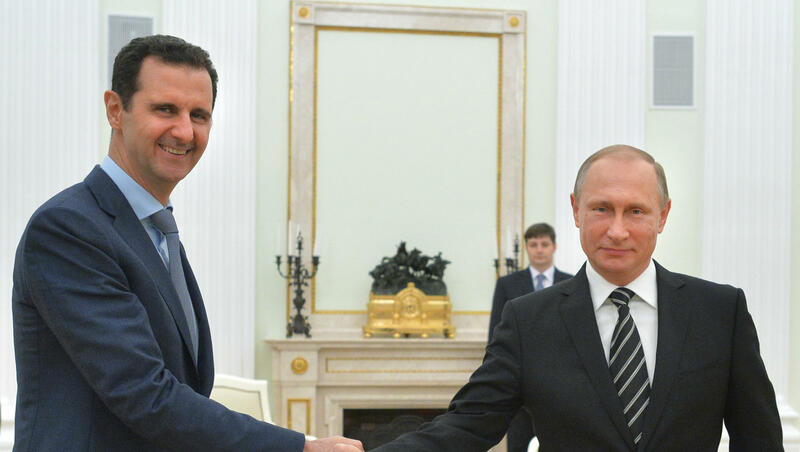 Moscow, Assad’s key backer, has been supporting the Syrian government militarily since 2015, turning the balance of power in Assad’s favor. Moscow has used its veto power at the U.N. Security Council on several occasions since the civil war began six years ago to prevent sanctions against Damascus. The two countries “enjoy a relationship of cooperation, of exchange of views and full mutual support,” said Peskov. Assad and his army are “the only real power in Syria that can resist terrorists on the ground,” he said. The Syrian government maintains it didn’t use chemical weapons, instead blaming opposition fighters for stockpiling the chemicals. Russia’s Defense Ministry said the toxic agents were released when a Syrian airstrike hit a rebel chemical weapons arsenal and munitions factory on the eastern outskirts of the town of Khan Sheikhoun. President Trump suggested Thursday that Assad may have to leave power in the wake of the chemical attack. The president would not discuss what, if anything, the United States might do in response to the deadly chemical attack. He said the attack “shouldn’t have happened, and it shouldn’t be allowed to happen.” U.N. envoy Nikki Haley strongly hinted some U.S. action was coming on Wednesday. Earlier, German Foreign Minister Sigmar Gabriel welcomed Mr. Trump’s previous strong condemnation, but warned against a military escalation and urged the U.S. to support U.N.-backed talks. French Foreign Minister Jean-Marc Ayrault urged a resumption of Syrian peace talks and said he wants Assad’s government prosecuted over its alleged use of chemical weapons. “These crimes must not remain unpunished. ... One day, international justice will rule on Assad,” Ayrault said.